LA La Land: Writers in the Round on a Late Sunday night in Hollywood Reviewed by Patrick O’Heffernan on March 28, 2019 . There is a phenomenon in LA (and maybe other music-oriented cities) called the songwriters round or writers- in-the-round. At a songwriters round, four or five singer-songwriters sit on stools onstage, usually holding a guitar, and sing one original song each and then it “goes around” and they each sing another original song, and so on. Usually, each artist gives a little history of the song, what prompted it, who collaborated with them if anyone, what they are doing with it now if they are still polishing it. Rounds last three or four songs – essentially a 12 to16-song set sung by 4 different artists along with conversation. Ostensibly these events are produced to expose rising singer-songwriters to music industry executives, radio programmers, music supervisors and others in the industry. 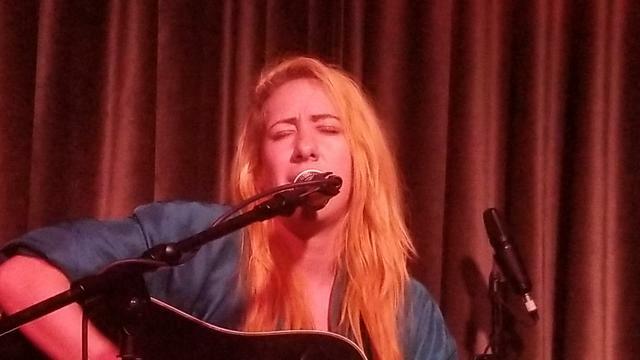 Some of that happens; but after attending several songwriter rounds I think the outcome is more one of exposing rising and risen singer-songwriters to each other as a creativity boost and a fun night of song, drinks, and introductions. Whatever the intended purpose, singer-songwriter rounds seem to be a great way for musicians to meet, swap ideas, contacts, opportunities and gigs. And they are a lot of fun. As a plus, since each artist brings friends, it usually guarantees a full house and a break even or profitable night for the promoter and the artists get paid! Sometimes the singer-songwriter rounds are stand-alone, that is, the only thing on the program is the round. BMI does this occasionally at the Genghis-Cohen combined Chinese Restaurant/music venue with church pews in a Jewish neighborhood (believe me, it works very well), or at the Gibson Guitar Showroom. Other times independent promoters assemble a full night of music that combines short sets by many artists plus a music round at a club. I went to one Sunday night and will be at another one tonight. 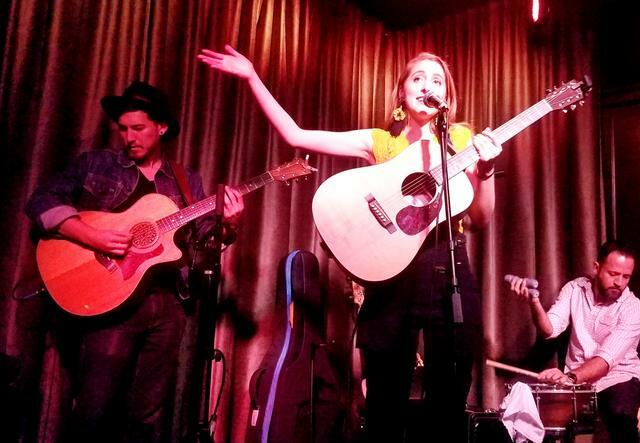 This past Sunday was DeRock & Friends at the 2nd stage of Hollywood’s venerable Hotel Café. 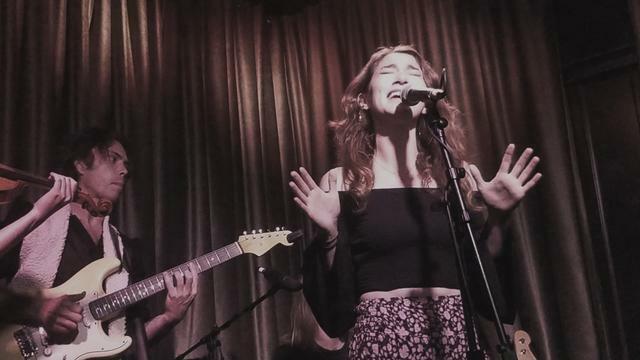 The Main stage was closed for the night, so it was a great way for the Hotel Café to bring in some money on an otherwise dark night, and for rising LA artists to get together and strut their stuff. 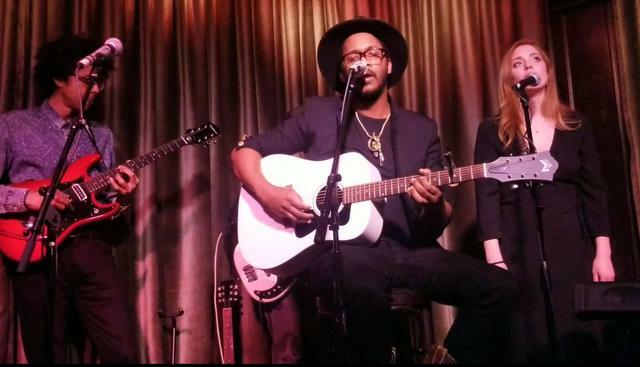 DeRock Tucker produced the show in collaboration with the Sound Collective, a local organization formed by singers Josh Arbour and Jared Saia that produces weekly showcases at the Hotel Cafe. 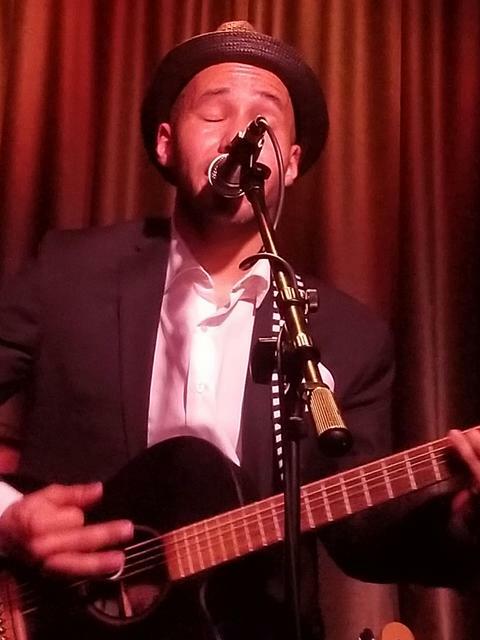 DeRock has done other showcases in Los Angeles, Long Beach and the San Francisco area and tours nationwide with other artists as a bass player, so he is experienced on both sides of the microphone. He is also a producer who works with a wide variety of LA artists, giving him a large network of musicians to draw upon for a show. And he did, quite nicely. The event was advertised as starting at 7 pm and when I walked in at 7:05, the 85- person capacity room was already about a third full. DeRock was onstage with his bass, opening the evening with his own music. He then moved to stage left to accompany Sachi, a Southern California alternative rock band led by a Japanese-American female singer who delivered a brace of flawlessly emotive rock ballads accented by a classical violin. When my friend Constanza Herrero hit the stage at 8 pm Second Stage was standing room only, a testament to her popularity despite being in LA only a short time. 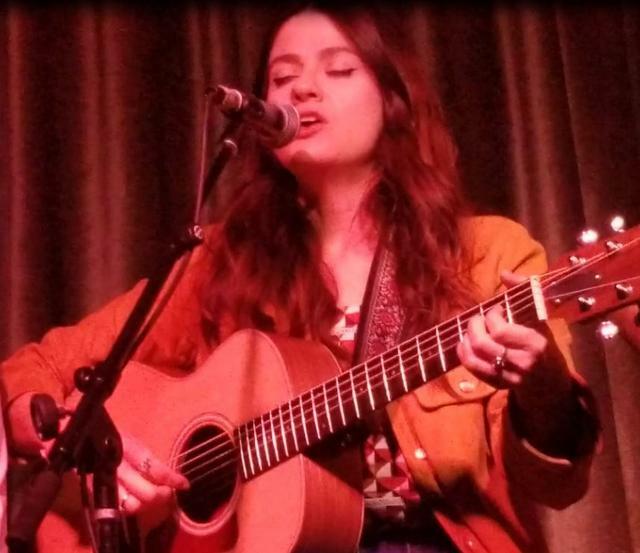 Constanza is an Australian/Chilean singer, songwriter and actress, winner of the John Lennon Songwriting Contest Grand Prize and a LA Music Critic Award in 2018. She delivered a short set accompanied by a superb guitarist and percussionist. Her songs ranged from pop to ballads to bossa nova and even to a love song done on the keyboard. With long golden hair, a gold top, and a smile that lights up fans all the way in the back of the room, it was easy to see why so many people had crowded in for her set. She was followed by Leanna Rachel, a stunning LA transplant to Bali with equally stunning love songs and a voice like a crystal bell. She accompanied herself with an Indonesian flat guitar and a Mbira — hand harp from Zimbabwe.Brandon Eugene Owens then cranked up the tempo in the next set and added a bit of his trademark the humor. Best known for his work on Kendrick Lamar’s Grammy Award-winning album To Pimp a Butterfly, he has also worked alongside Kris Bowers (Dear White People), Kelis, Fergie, Brenna Whitaker, and Glen Ballard- and scored songs for the TV series One Tree Hill, Parenthood, and Greys Anatomy, among others. Another friend of mine and in my mind a star, Dree Mon, took the stage. Resplendent in what I think is relatively new blond hair, the super funky, multiple award-winning pop artist who made her debut in 2017 with the standout “Rebel Soul” kept us head-bobbing, laughing and thinking through her set. I say “star” because she can be heard on many media outlets, including TV shows (Parenthood and White Collar), films (No Service, Wingman Inc!, and Love of War), web series (Liv Out Loud), and she has a track and a feature on international artist Robert M’s album 2013. After a pause, Gilbert Louie Ray Montoya, normally a one-man band, came onstage with Phoebe Silva on the fiddle and a bass player to play a full Americana set, complete with jokes, laughs, and in general lots of fun. The long set was a nice break – it allowed us to get a little better feeling for the artist than we could with the four-song sets of the artists in the first half of the evening. “Gill” wrapped up at 11 pm, which was late for a Sunday night even in Hollywood, so the room had emptied to about half full as the actual Writers in the Round began. But the mood was still ebullient and the five people lined up on stage – Oriah, Alicia Blue, Phoebe Silva, Gilbert Louie Ray, and Taylor Hungerford (aka Tar & Flowers). Each singer gave us a short story of a song before it was sung. In all, there were three rounds, all vocals except for Taylor Hungerford in the last round who delivered a beautiful guitar instrumental. They varied from the confidence of Alicia Blue with her heart-grabbing lyrics and uniquely pitched voice, to some shyness from Oriah who confessed to being nervous but did just fine. Each of the writers was outstanding in their craft and entertaining for the audience. I think the format of an onstage lineup is a bit awkward, however, for the artists; they have to sit still, look interested (and not thinking about their next song) and smile at the audience while others play. Actually, they usually kind of fidget a little while they sit on their stool waiting their turn. However, the Writers Round served its purpose: we all got to hear the songs of outstanding writers and performers. More important, they got to hear each other, exchange cards, contacts, music ideas and maybe even end up playing each other’s bands. It was a long night, but a good one.